Pressure washing and sealing by Clean N’ Seal can remove the most stubborn stains, tire marks, and unsightly grime from your concrete driveway. We can remove much more than ordinary pressure washers, because we use specialized equipment that cleans with heat and precise mechanical control. Hot water cleans better than pressure washing alone. Clean ‘N Seal has specialized equipment that heats the water to very high temperatures. On the toughest stains we crank our heaters up to clean with pure steam. We employ safe cleaning techniques that keep you, your home, and your vegetation safe and sound. 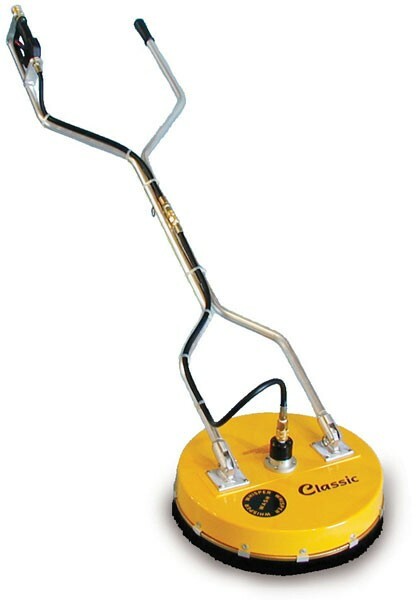 Anyone pressure washing a driveway should us a Flat Surface Cleaner for the simple reason that it produces better results much faster than using a handheld wand. I addition to being slow, handheld wands can gouge permanent stripes into concrete. Unfortunately, most power washing contractors do not use flat surface cleaners, for no other reason than they are expensive to buy. Clean ‘N Seal has flat surface cleaners specially configured for Bay Area driveways. By investing in the best equipment we are able to offer superior results. Having the right tool for the job keeps our pricing very competitive. After your driveway has been thoroughly cleaned we treat it with a commercial grade Seal ‘n Lock sealer. Our water-based sealant is tougher than the best solvent sealers and protects your driveway from oil stains and tire marks without the harmful fumes and toxins of solvents and epoxies. We guarantee your driveway will look clean and new. We offer a 2 year residential warranty and a 1 year warranty for commercial applications. Other sealers cannot take water and need to be 100% dry before applying. Our sealer can be applied while joint sand and pavers are still wet. This cuts down the application time by days!